BUFFALO, N.Y. -- The University at Buffalo women's swimming & diving team will head to Cleveland, Ohio on Friday as they are set to compete in the Magnus Cup Invitational hosted by Cleveland State University in the Busbey Natatorium. The Magus Cup Invitational, which is hosted annually by Cleveland State University, has grown annualy since its inception. Now entering its seventh year, this will be the second time the Bulls have competed in the event, the first since 2014. Buffalo is set to compete against 16 other programs from around the country, including Cleveland State, Akron, Delaware, Fairmont State, Indiana (Pa.), Simon Fraser, Soka University, Xavier, Youngstown State, West Virginia Tech, California (Pa.), University of the Cumberlands, , Duquesne, Indiana State, and Saint Francis (Pa.). 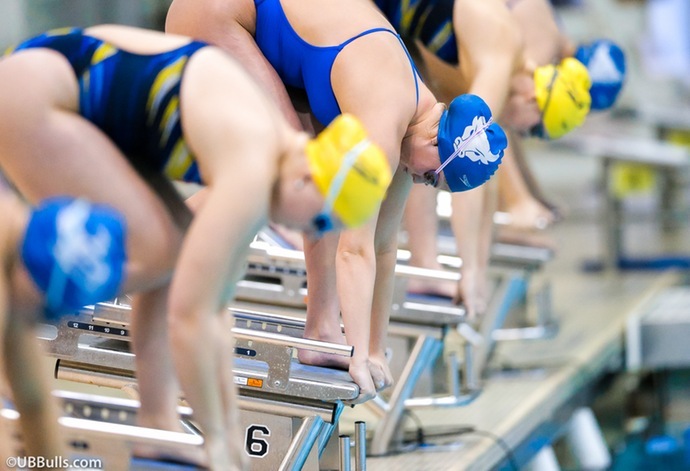 The Bulls are returning to action after a dropping their season opening dual meet against MAC foe Akron which saw Buffalo collect seven victories in the pool despite falling to the Zips, 164-136. Junior Katelyn Burns had a strong showing for UB on the day, as she collected two individual victories in the 50 yard freestyle and 100 yard freestyle events. UB diver Olivia Gosselin also impressed for the Bulls against Akron, as she claimed her first individual victory of the year in the diving well in the 1-meter dive event, collecting a score of 268.50. The Magnus Cup Invitational, which gets underway Friday morning at 9:00 AM with preliminaries, will run through Sunday. Swimming preliminaries will begin at 9:00 AM each day with finals commencing at 5:00 PM Friday and Saturday, and at 3:00 PM Sunday. Diving preliminaries are scheduled to take place on 1:00 PM Friday and Saturday, followed by finals at 5:00 PM. A full schedule of events is listed below.